If you are only going to start one game for a club then make it a memorable one. That's something Duane Courtney did and I don't think he'll ever forget his one and only start in Burnley colours. He came in for the injured Michael Duff at Luton in November 2005, and played the entire ninety minutes in a remarkable game which saw goalkeeper Brian Jensen sent off, midfielder John Spicer go in goal and Ade Akinbiyi win it for us with a hat trick. Courtney had been an apprentice at Birmingham City but wasn't offered professional terms leaving him looking for a new club during the summer of 2004. He was snapped up by Bernard McNally who had taken over as manager of brand new club AFC Telford United who were set to play in the Unibond League Division One in their inaugural season. They, and Courtney, had a good season. They won promotion to the Premier Division via the play offs and Courtney won both the supporters and players player of the year awards. There were hints of Football League clubs interested in him but he started the 2005/06 season at Telford, but then spent time with both Burnley and Wolves on trial. 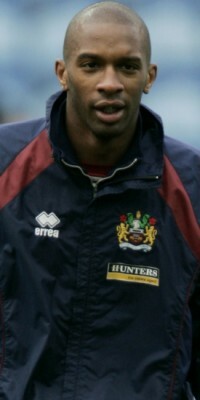 On August Bank Holiday 2005, Wayne Thomas suffered a cruciate ligament injury at Reading. The transfer window was about to close and Steve Cotterill had to move quickly. He made a last ditch attempt to bring Gary Cahill back in on loan and when that came to nothing he nipped ahead of Wolves to sign Courtney on a two year contract for a fee of £25,000. For much of that season he was a reserve team player, making just that one start at Luton where he did OK after a very nervous start. Alongside that were another seven substitute appearances with all but one of them coming during a period of one month in October and November. He made one more appearance, as a late substitute at Ipswich in February, and at the end of the 2005/06 season was placed on the transfer list. Former Burnley coach Mark Yates offered him a deal at Kidderminster but he turned that down following advice from his agent. With the transfer window only two weeks from closing in August, the club cancelled his contract, and by the end of the month he was at Bury on trial. That came to nothing and eventually he joined Welsh Premier League club The New Saints and went on to win a Championship medal. Again Kidderminster tried to sign him in the summer of 2007, but again he's turned them down and opted to remain with the Welsh club. He remained with TNS for three years, winning a Championship medal in his first season as well as being selected for the Welsh Premier League side. He was released at TNS at the end of his contract after the 2008/09 season. He joined Kidderminster Harriers for pre-season training and after impressing in the opening friendlies he signed a one year deal on 20th July 2009, Kidderminster finally getting their man at the third time of asking. He signed for York City in the summer of 2010, having left Kidderminster, but things didn't work out for him and he wasn't able to win a regular place in the first team. That led to him being released in January 2011. He signed for Tamworth on 3rd February and made 18 appearances for them in the remainder of the 2010/11 season. He impressed in those appearances and did enough to earn himself a new deal and on 22nd June 2011 signed a two year contract with Tamworth. Courtney remained with Tamworth until the end of the 2013/14 season. His most successful season was 2012/13 when he won the manager's, the players' and the supporters' player of the year awards. However, a disappointing 2013/14 season, in which he didn't play after January through injury, ended in relegation and he moved on at the beginning of June 2014, returning to the Conference Premier with Alfreton. He spent the entire 2014/15 season with Alfreton, but at the start of June 2015 he signed a deal with Sutton Coldfield Town. Three weeks later he reneged on that deal and instead signed a two year deal with Corby Town.